CAUGHT ON CAMERA: Proving who was behind the wheel could pose a challenge for the courts. MONTREAL, Que. –This spring or summer government cameras will start taking pictures of cars that speed and run red lights and mail “statements of offense” to the vehicle owners. They will have three choices: Confess to the offense, persuade the driver at the time of the alleged offense to confess, or simply hand over the name of the most likely suspect to the courts. That may read like Orwellian hogwash (“Turn in your friends and win fabulous prizes!”) but it is the very procedure spelled out in Bill 42, passed last Dec. 19. 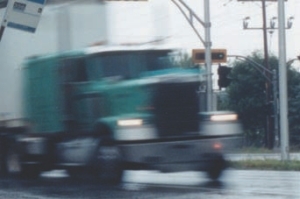 Quebec’s National Assembly, despite detailed arguments against photo radar by the Quebec Trucking Association (QTA), the Quebec Forestry Industry Council and the Quebec Independent Workers union (Metallos FTQ), passed Bill 42 with the offending section in-tact. As soon as it selects the hardware, Transports Quebec will install photo radar in 15 locations – five each in Montreal, Monteregie and the Chaudier-appalache region, for an 18-month or more trial period. This is how things will play out for trucks:A photo radar takes a picture of the rear end of a speeding trailer. The plate is matched to its registered owner and mailed off with a statement of offense. The owner has 10 days to decide who the guilty party should be and mail back a signed declaration. If the owner was driving the tractor pulling that trailer (the cameras are not allowed to shoot the driver) he is welcome to confess. But if it was not him, he is welcome to track down the real culprit and ask him kindly to sign a confession and take his licks. If the driver refuses to sign, the owner can still turn in his name as long as he notifies the driver of that. Since Bill 42 states that the owner may be convicted of the offense, “unless the owner proves that the vehicle was in the possession of a third party without the owner’s consent at the time of the offence,”there is considerable motivation to find someone to blame. But say a driver was coerced to sign the declaration, oh, say, on pain of being fired, assigned a lousy route or some such. He reluctantly signs but, as is his right, pleads not guilty. “You have the right to plead not guilty and the defendant has the right to have all the evidence disclosed to him. A driver confession could be part of the evidence. But a confession has to be voluntary and the prosecution has to prove that. If the driver says he signed the declaration because he was threatened, the declaration will be thrown out of court,” he explains. Likewise, the driver can plead not guilty and have his day in court if the owner sends in the declaration without the driver’s signature. In this deteriorating scenario the prosecutor has to prove it was the driver behind the wheel. But how will they do that? “Now the prosecutor has to subpoena the employer and have him testify against the employee. The employer has to prove how he knows, in fact, that it was that driver behind the wheel,” Rouette says.